advantages of machine-made objects. The forms of nature, the patterns of ancient tradition—Japanese, Celtic, Byzantine-were stylized and recreated as coiling, twisting, free-flowing linear designs that we find so often sculptured in low relief on our public buildings. One of the craftsmen of this period that we should take note of was Louis Comfort Tiffany, a designer whose name has become almost synonymous with stained glass art. We see quite clearly the stylized forms of the Art Nouveau in the designs he used. In direct contrast to the experimental trend of Art Nouveau was the formal elegance of the Beaux-Arts classicism. According to Foley, "the key was money". Between 1880 and 1920, the Gilded Age flourished, fed by the social ambitions of the Astors, the Vanderbilts, the Rockefellers —names that are legendary in the financial history of our nation. Their requirements were not for homes that were "picturesque" or "romantic"; they wanted grandeur and elegance. Great office buildings bearing their names represented their tastes which were shaped by the architects who studied in the foremost school of architecture in the world, the Ecole des Beaux-Arts in Paris. The first American to attend this school was Richard Morris Hunt, whose first Beaux-Arts building was the magnificent chateau on Fifth Avenue in New York—the Vanderbilt mansion. That trend, coming at the tag end of a free-wheeling Victorian era, was a return to classicism, sometimes calm, elegant, refined, sometimes exuberant, exaggerated, overdone. The notable characteristic of the fashion was its complete dependence on historical tradition. 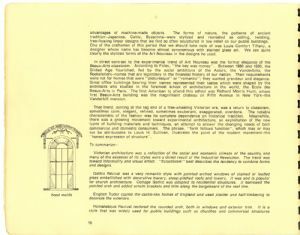 Meanwhile, there was a growing movement toward experimental architecture, an exploitation of the new types of building materials and techniques, an attempt to answer the changing needs of both commercial and domestic consumers. The phrase, "form follows function", which may or may not be attributable to Louis H. Sullivan, illustrates the point of the modern movement—the "honest expression of structure". Victorian architecture was a reflection of the social and economic climate of the country and many of the excesses of its styles were a direct result of the Industrial Revolution. The trend was toward informality and visual effect. "Eclecticism" best describes the tendency to combine forms and designs. Gothic Revival was a very romantic style with pointed arched windows of stained or leaded glass embellished with decorative tracery, steep-pitched roofs and towers. It was and is popular for church architecture. Cottage Gothic was adapted to residential structures. It borrowed the pointed arch and added ornate brackets and trim along the bargeboard of the roof line. English Tudor copied the castle-like homes of England and used plaster and half-timbering to decorate the exteriors. Romanesque Revival restored the rounded arch, both in windows and exterior trim. It is a style that was widely used for public buildings such as churches and commercial structures.